This is the violent opening line to Tess Sharpe’s debut adult novel, Barbed Wire Heart, spoken by the young female protagonist/antagonist, Harley McKenna, and sets the trend for most of the novel. Yet despite the unambiguous violence within, there is nothing gratuitous about it. Shortly after this killing witnessed by eight-year old Harley, her mother is killed in a meth lab explosion, and everything changes for the young girl—forever. Harley is the only child of North County’s biggest criminal, Duke McKenna. He has run more guns, cooked more meth, and killed more men than anyone around. Harley’s been working for him since she was sixteen—collecting debts, sweet-talking her way out of trouble, and dreading the day he’d deem her ready to rule the rural drug empire he’s built on blood and violence. Never cut the drugs—leave them pure. Guns are meant to be shot—keep them loaded. Family is everything—betray them and die. However, Harley time’s is quickly running out. The Springfields, her family’s biggest rivals, are moving in on North County. Years ago, they were responsible for her mother’s death, and now they’re coming for Duke’s only weak spot: Harley. With a bloody turf war threatening to consume North County, Harley is forced to confront the truth: that her father’s violent world will destroy her. Dukes raised her to be deadly—he never counted on her being disloyal. But if Harley wants to survive and protect the people she loves, she’s got to take out Duke’s operation—and the Springfields. Blowing up meth labs is dangerous business, and getting caught will be the end of her, but Harley has one advantage: She is her father’s daughter. And McKennas always win. But can Harley continue to win, even when the odds are quickly stacking up against her? A heart-wrenching sub plot in the story focuses on the plight of abused women and children. Harley runs a safe house with Native America woman, Mo, and defends the sanctuary with the same passion and fierceness she has defended everything in her life: force and not-so-gentle persuasion. 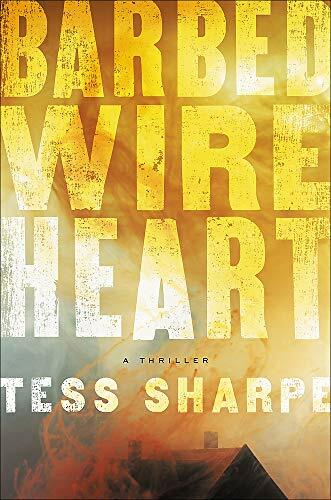 Talk of the inevitable sequel to Barbed Wire Heart is to be welcomed. It will be interesting to see if Sharpe can maintain the extremely high standard she has set for herself and her writing with her unflinching portrayal of a poor, rural community where family is everything.